Based in Surrey we operate over most of Kent, Sussex and Surrey. We supply and install quality stairlifts from leading UK companies to customers in the Crawley and surrounding areas . Our stair lifts are bespoke to fit both curved and straight stairs and come at very competitive prices. We provide a warranty with every stairlift which includes call outs, parts and labour. Remember when you buy a stairlift you are buying the warranty ! Rental stairlifts options are available ( from £10 per week for a years rental ). Brand new Brooks / Acorn stairlifts and also quality, used reconditioned stairlifts from just £699 . Please contact us for a free, no obligation home survey and quotation. Estimates sometimes available over the phone . Please ring us if you have any questions . 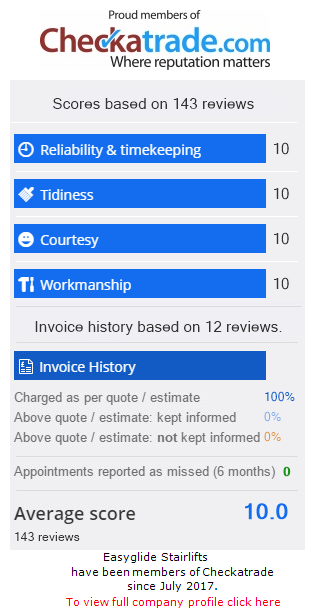 Meanwhile please take a look at some of our genuine customer reviews / testimonials below.